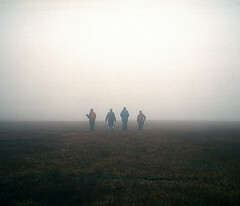 Studying the origin of life is an intractable problem, a little like navigating the misty trackless waste that is central Dartmoor. For an event that happened so long ago, we are unlikely to find a ‘smoking gun’. If life originated on another planet and then somehow seeded life on Earth – a possibility that is being taken seriously at the moment – we have even less hope of finding a solution. This was Christopher Southgate’s impression of the field of origins research until a few years ago. Chris is a theologian and former biochemist based at Exeter University, and in his Faraday seminar on New Approaches to the Origin of life: Scientific and Theological last week, he explained why he is now a little a more hopeful. He also described a very unique research programme that combines both science and theology. The astronomer Dr Jennifer Wiseman visited Cambridge recently to speak about her work on ‘exoplanet’ discovery. Exoplanets are planets in solar systems other than our own, and until 1989 they were the stuff of science fiction. Now we know there definitely are other planets in the universe, some of which may be like Earth. The discovery of life on other planets – perhaps single celled organisms – in the next few decades is a real possibility. Our universe is active and fruitful. We live in an abundant universe, and can celebrate that with new knowledge. The changes made to the Hubble telescope in 2009 have brought us beautiful new pictures that show the universe in greater depth than ever before. 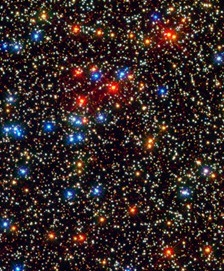 This one of the Omega Centauri star cluster shows a startling variety of stars.